Learning how to draw hands in motion requires a special approach. Hands play an important role in the composition below. They look like they are moving. I have purposely chosen not to make the hands detailed. What you see is a general blur of the fingers, juxtaposed against the very detailed figure. This contrast adds interest while also emphasizing hand movement. Notice there are no sharp edges on either hand. Both hands were done with a soft brush to get that blurred look and to make the edges appear to diffuse into the background lighting. Despite the desired "fuzzy" look of the hands, I was careful to maintain the integrity of the hand structure. Then I used a kneaded eraser to create very subtle streaks across both hands. I emphasize subtle. If done too obviously, these streaks could make the piece look more cartoon-like than realistic. The blurred hands were already moving...the subtle eraser streaks were the "icing on the cake". First, I established a very light outline of this hand (see next image below). 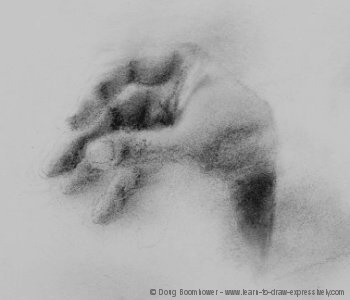 To imply movement, the hand is purposely done in soft textures with vine charcoal. My concern is not with detail (because when something is moving, you do not see detail), but rather with blocking in the broader areas of lights and darks. 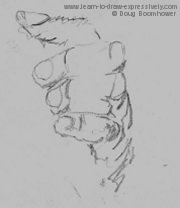 Without adding detail, some areas (finger joints, knuckles, thumbnail) are more firmly established to give definition to the moving hand. These areas are done lightly with a 3B charcoal pencil. Everything is done with watercolor brushes so I can create a blurred effect. Things that move appear blurry. The cuff of his jacket was treated in the same way, to imply movement. 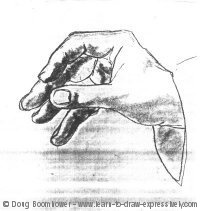 Rather than drawing the outline of the fingers, each finger is defined by the shadow underneath it. This implies two things: that the finger is moving.... and that the tops of the fingers are bathed in light. I often do this when creating my large charcoal pieces. This allows me the freedom to impose the gestures I want. Note the movement in the hand. The pencil drawing on the left was a preliminary study. You'll notice the first finger in this drawing has ragged edges . . . in preparation for the final charcoal piece. 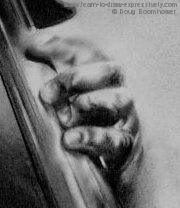 The final charcoal drawing on the right shows movement in the first finger, contrasted against the other three fingers which are static. 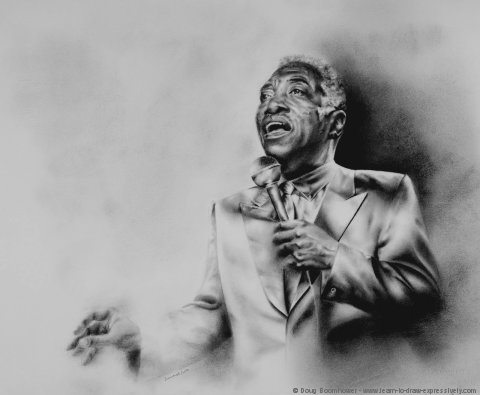 That movement was created with a soft brush and soft charcoal leads (3B charcoal pencil, a stick of vine charcoal). In order to give the finger some definition, I have subtly implied the fingernail, and a shadow underneath the finger. 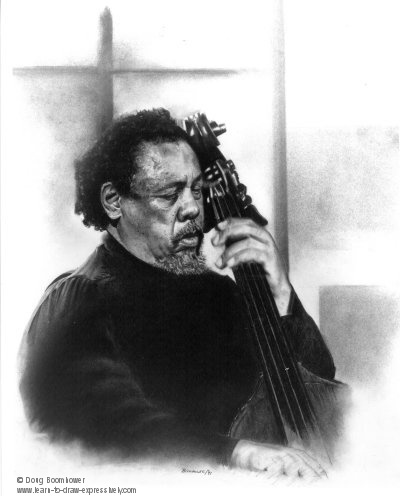 Here is the first version I did of Charlie Mingus in 1991. 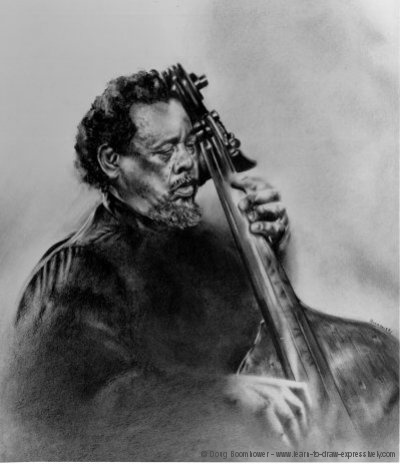 Over time I did four versions of this drawing because I'm a fan of Charlie Mingus. Each version was changed in some way. If you look closely, you will see a very subtle suggestion of movement of his hand . . . particularly the first two fingers. I did this by drawing the hand with a 3B charcoal pencil, and then working over it with a brush. When you are learning how to draw hands in motion, subtlety plays an important role. In this case, there is some movement in the hand, but the viewer has to look for it. 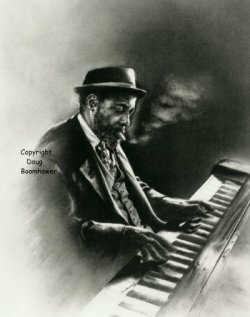 Compositionally speaking, the lack of detail in the hand contrasts nicely against the detail in the face, and the wooden head of the bass.